Fewer players. Reduced benefits. Another money grab. Potential Baazov return. Amaya executives move to shrink online poker activity. This past weekend, the world’s largest poker site sent an email to players which outlines upcoming changes to the PokerStars VIP Club rewards system. A “new and exciting” loyalty-based incentive program will be launched at some point in 2017, ushering in slightly reduced (on top of heavily reduced) benefits for high-volume players, inactive account clawbacks and promises of more rewards-scheme vernacular coming our way in the next calendar year. TwoPlusTwo forum poster WeRnIS was the first to bring the email to the News, Views & Gossip boards. The topic is currently active and our readers are encouraged to join the discussion linked below. Over the weekend, the news was being met with mostly frustration by contributing members of the TwoPlusTwo NVG community. Poster mcc3504 opines that the pending inactive StarsCoin absorption reveals the brand to be “scum” while _jimbo_ calls the company’s aim to convert existing online poker players into long-term pit game patrons “delusional.” A direct link to an August 2016 Amaya financial statement has been provided by cilderr. The document shows roughly $52 million in non-redeemed Customer Coins at the bottom of Page 21 — a percentage of which is now earmarked for Amaya’s corporate coffers next summer. Poker Life Podcast host and OnePokerLife.com owner Joey Ingram got into the mix Friday by sarcastically referencing PokerStars’ insistence that nosebleed rake policies and reduced rewards are in line with what’s best for recreational players. As it stands, PokerStars still makes up approximately 70% of the global online poker market heading into next year. The site has by far the largest combined player base and brand name recognition in our industry, an established two-tier live event format (Championships and Festivals), an under-performing yet intriguing poker league in the GPL, and a large team of viewer-friendly pros — led by Daniel Negreanu and Jason Somerville — who actively reach out to players while providing the company with a solid presence on social media and third party casting platforms such as Twitch and YouTube. To the casual observer, Amaya’s monopolistic position appears to pave the way for continued poker dominance over the next 13 months; a viewpoint that is generally agreed upon by contributing members of the community. However, a closer examination of Amaya’s direction points towards an overall decrease in online poker activity along with a relevant loss in PokerStars’ market share to its competitors in 2017, with both trends likely to be a direct result of Amaya’s in-house desire to grow its casino and sports betting verticals through its existing online poker base. Amaya Q3 Financial Results, Baazov to the Rescue? In perhaps Amaya’s best combo-press release since March of this year (when the company announced RoW rake changes and launched its New Jersey platform on the same day), Monday’s Q3 2016 Financial Results were presented alongside a $2.56B USD buyback proposal headed by the none other than the former CEO David Baazov himself. As CalvinAyre.com contributor Steven Stradbrooke aptly noted in the article linked above, the former Amaya CEO has “seen the light” and wants to grab hold of the steering wheel once again — this time in an effort to privatize his former penny stock project. Unfortunately for the online poker industry, Baazov currently faces criminal insider trading charges brought forth by Quebec’s Autorité des marchés financiers and suffers from a heavily tarnished reputation highlighted mainly by his refusal to honor promised rewards payouts to PokerStars’ highest-volume players during his pre-resignation tenure as Amaya’s shot-caller. 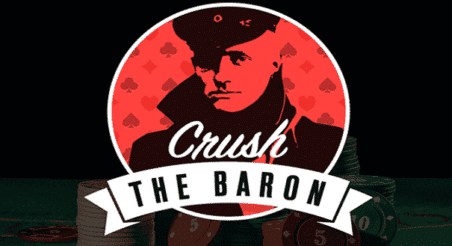 Although Baazov is often ridiculed for taking the roach clip approach to sucking every consumable asset out of online poker before discarding the industry entirely for casino/sports betting platforms, he was responsible for bringing Poker Life Podcast host Joey Ingram out of retirement in March. So there’s that. Additionally, a new round of Photoshop creations will likely hit social media platforms and search engines for the remainder of November while the latest AmayaStars saga plays out. So the community has David Baazov to thank for that, too. As Upswing Poker featured pro Doug Polk and Pot Limit Omaha spokesperson Joey Ingram prepare for the debut of their upcoming show this week; and as podcast hosts/writers across the poker media realm warm to the task, poker fans worldwide can only wonder at what counter-measures Hollreiser’s Hypocrites will slobber forth in yet another futile attempt to control the online poker news narrative.